The 2019 summer outdoor play schedule listed below will officially begin June 1. ​However, more spontaneous, club-sponsored play will begin as soon as the Riverview Park courts are clear of snow and weather permits. Play times and days will be announced via email. If you want to be added to the Eagle River Pickleball email list, please use the Contact Us form. Open play is free to members of Eagle River Pickleball Association. Non-members are welcomed to play and pay a $1/day fee. 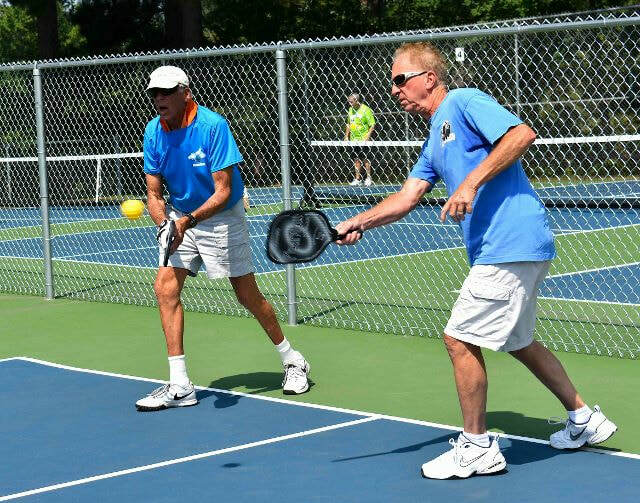 Whether planning to play stronger players than you or weaker players than you, be sure to read these Tips from The Pickleball Guru's on playing up or down. Beginner lessons will return again for summer 2019. Pickleball paddles will be supplied for those participants who do not have one. More details will be available soon. Drills will be available for summer 2019. Drills are designated opportunities for players to practice improving specific skills while not playing a game. More details will be available soon. Members interested in playing on a specific court (Lite, Intermediate, Advanced) should stack paddles in the staging area. When a court opens, the players with the first two paddles (or first four if a lot of people are waiting) should enter the court. Staging area: Stack paddles in the basket attached to the fence outside Court 1. Staging area: Stack paddles in the basket attached to the fence outside Court 3.